The first time I made these for dinner I ate 2/3 of it by myself. This is a strong, fresh flavored dish. I make it just with Brussels sprouts or a mixture of cauliflower and Brussels sprouts or just cauliflower. You can certainly use broccoli or other roasted vegetables too. To make it vegetarian substitute 2 tablespoons soy sauce or tamari for the fish sauce. For the vinaigrette, combine the fish sauce, water, vinegar, lime juice, sugar, garlic, and chilies in a jar. Taste; If too salty, add more water and/or lime juice. This vinaigrette will keep for up to a week in the refrigerator. Combine the vinaigrette, cilantro stems, and mint in a bowl, and set aside. Peel away any loose or discolored outer leaves of the Brussels sprouts, trim the ends and cut the sprouts in half. Cut any especially large ones in quarters. Wash well and pat dry. 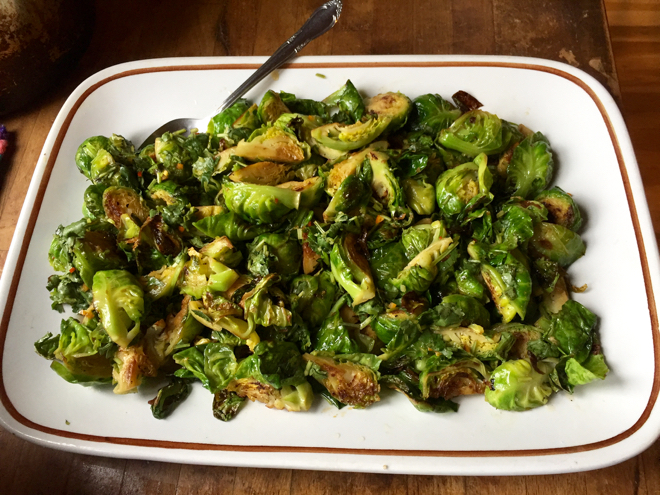 Now you can either roast the Brussels sprouts in a 400 degree oven tossed with a bit of olive oil or you can start them on the stove top in 2 large skillets, cut side down in a splash of oil. If you do the latter, cook them undisturbed like this over medium high heat for about 8-10 minutes until nicely browned on the cut side. Then move the skillets to the oven and continue roasting for about 15 minutes until tender but not at all mushy. And if you don’t have two large skillets or are cooking more sprouts for a larger crowd, roast them in the oven: toss them with 1 tablespoon of oil per pound and spread them on a baking sheet, cut sides down. Roast in the oven, checking for browning every 10-15 minutes, tossing them around with a spatula only once they start to brown nicely. The sprouts are ready when they are tender but not soft, with nice, dark brown color. When ready to serve (warm or at room temp), toss the Brussels sprouts with the dressing to taste and cilantro leaves and mint, if using, and toss once or twice to coat. You might not need quite all the dressing so start with 2/3 of it.